To practice Tactics Box 1.1 Vector Addition. Vector addition obeys rules that are different from those for the addition of two scalar quantities. When you add two vectors, their directions, as well as their magnitudes, must be taken into account. This Tactics Box explains how to add vectors graphically. Place the tail of B⃗ at the tip of A⃗ . 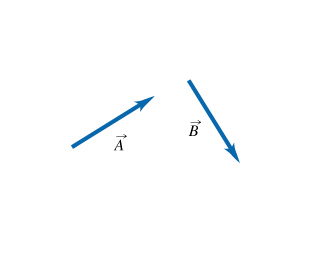 Draw an arrow from the tail of A⃗ to the tip of B⃗ . This is vector A⃗ +B⃗ . Create the vector R⃗ =A⃗ +B⃗ by following the steps in the Tactics Box above. When moving vector B⃗ , keep in mind that its direction should remain unchanged. Create the vector R⃗ =C⃗ +D⃗ by following the steps in the Tactics Box above. When moving vector D⃗ , keep in mind that its direction should remain unchanged. The location, orientation, and length of your vectors will be graded.